It first appears in Bugs (1x08). 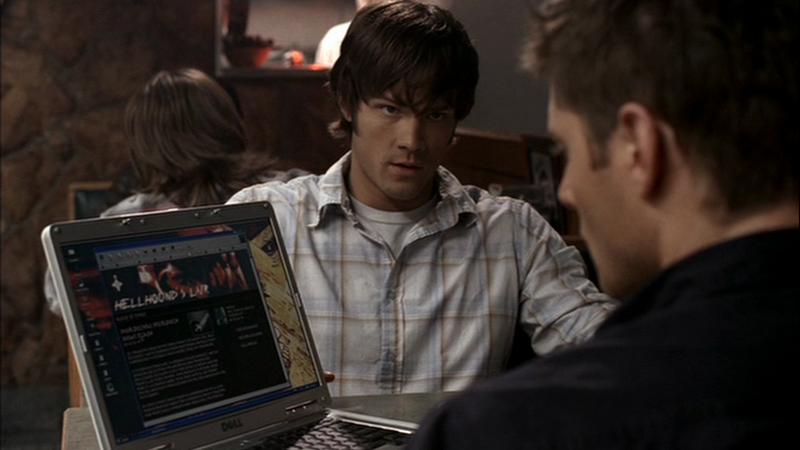 Sam is wearing it when he’s lounging outside the biker bar at the beginning of the episode, and when he and Dean do their initial investigation of the subdivision. In Faith (1x12), it is possibly the shirt that Sam is wearing underneath his jacket and/or hoodie, as he researches in the motel room and then heads off break into the preacher’s house and then eventually to stop the preacher’s wife. In Hell House (1x17), Sam puts it on after his shower and wears it for his very itchy coffee shop experience, then over to Ed and Harry’s to feed them false information, then to the diner to wait for them to update the website, and then over to the Hell House to try to get rid of the Tulpa. In Children Shouldn’t Play With Dead Things (2x04), Sam is wearing this shirt at the very end of the episode, when Dean cries at the side of the road. In Fallen Idols (5x05), Sam resurrects this shirt at the end of the episode when he and Dean pack up the Impala and have a chat.